I am looking to move from Fort Wayne,IN to a warmer place like California. A recruiter contacted me about a potential job position (Software Engineer) in Torrance,CA but I'm not sure if what he told me is accurate and true. When he asked me about my salary he told me that the cost of living difference between those 2 cities (Fort Wayne,IN and Torrance,CA) is around 15% which from my research seems out of proportion. So basically he told me I would be making 15% more money which I found ridiculous. According to what I have found there is a 49% cost of life difference between those 2 cities. For example I am paying $560 for a 2 bedroom apartment with refrigerator, dish washer machine, washer, drier and I live in a very quite zone which is one of the main reasons I will be looking for if I move. By googling apartments for rent in Torrance,CA seems like the average for a 2 bedroom apartments is $1600 if not more. I would not like to accept a job offer just to find out that I can barely make enough money to live. 560 in Torrance is barely renting a room in someone's house. So $1,600 for a 2 bedroom aparment in a decent zone seems accurate? Water: Nothing. Included in the rent. Gas price: $3.49 per gallon. Groceries: Depends but on average $200-$250 per month. Fuel: $4.21 for regular unleaded in Torrance at the moment. So are we talking about $2,000 per month for a 2 bedroom apartment? Damn !! I don't think I can affort that with a 15% salary difference. I can't say for sure. Look at some online listings from established agents. Don't go by what Craigslist says. Your research is largely correct. For engineering salaries....I used to work for a south bay engineering company...in 1996 project managers made $130-140 k a year. My brother, starting out of college with no experience made $55k a year as a software engineer. Two years later he was at $70k. That was in 1998. I'd imagine salaries at least remained flat in that time. 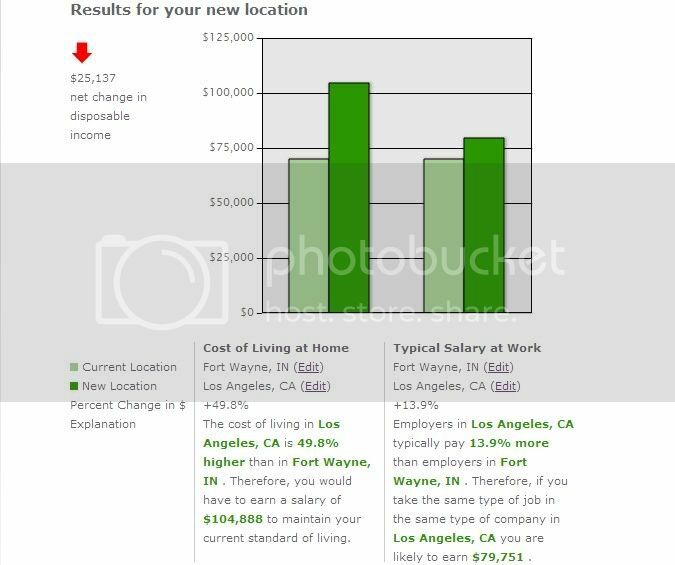 Well according to my research and the data from salary.com, a Software Engineer (4-5 years of experience) with a salary of $70,000 in Indiana should be making $96,000 in Torrance,CA to maintain the same cost of living. What do you think of these amounts? Maybe in adjacent Redondo Beach but Torrance is more affordable. I'd say around $1400-1600 for a nice 2BR apartment. $2000 would probably get you a nice 2-3BR house in Torrance. You can check Craigslist and Westsiderentals.com to get a general idea of rental prices.